HomeCooki: What I am Waiting for to Fully Renovate My Kitchen? 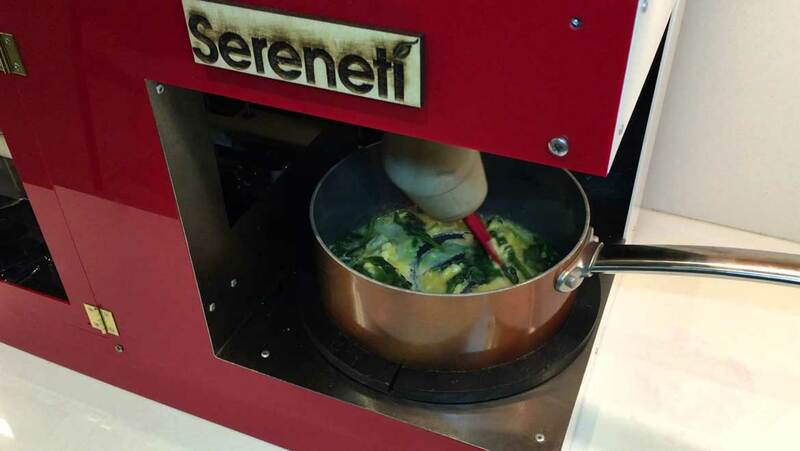 The Cooki robotic chef, together with the food ecosystem Foodi from the small startup company Sereneti Kitchen, is the technology that many are waiting for to gain confidence when entering the kitchen. All you have to do is to provide the ingredients to Cooki and just wait for your ready meal! The main idea is that Foodi ecosystem will bring back into our kitchen the fresh ingredients and the exploration of the food world, and to start to forget the frozen pre-packaged meals and non-healthy food delivery. The robotic chef was firstly introduced at TechCrunch’s Hardware Battlefield at CES 2015, and presented as an automatic tool that helps people cook. At the time, the Sereneti device was a self-contained unit which used a small robotic arm with a spatula attachment to stir the ingredients in a cooking pot, actually mimicking the human arm motions. The company returned this year at CES 2016, with an improved version of the Cooki, which has a more ergonomic design and takes into account safety issues. The arm’s motors are now located further away from the saucepan, while the arm consists of simple mechanical joints. It can be detached from the top joint and cleaned in a dishwasher. What is so smart about it? When compared to humanoid robotic advancements intended as kitchen helpers, such as the world’s first robotic kitchen proposed by Moley and expected by 2018, Cooki doesn’t seem very advanced. Moley robotic hands come with numerous actuated degrees of freedom, tactile sensors and sophisticated control systems, while MK1 can download a recipe and reproduce it exactly as a professional chef would have cooked it. Cooki actually builds on the ground of traditional kitchen appliances technology, and is priced accordingly. The device is controlled through a mobile app, which allows you to select the recipe you want to cook and, once you place in the fresh ingredient pods, it guides the machine through each step of the cooking process. The ingredients are added individually to the pot at the appropriate time and temperature and a notification is sent to your mobile when your dinner is ready. The current version can only handle up to four ingredients, but it is expected that the final version will be modular, to accommodate more complex recipes, and it will also include a ring over the pan to add oil, salt, pepper and spices. Mass production of Cooki is expected to start next year and it is expected to cost about $500. Cooki’s food doesn’t meet the expectations of a professional chef, but if you prefer healthy homemade food made with fresh ingredients and you don’t have the time or you don’t know how to cook, then watch out for Cooki. Sereneti also promises to sit down with some local chefs to pick their brains about what truly constitutes a balance between healthy and tasty, which sounds quite good for the future development of this technology.